What is SVN and what are you talking about? FreePBX keeps all of it’s source in our [url=/trac/browser]Revision Control System[/url] as does any properly run software project whether it is Open Source or not. 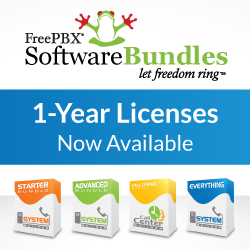 For FreePBX, we use the Subversion SVN system. The purpose of such a system is to easily manage changes and releases, recover from mistakes, experiment with new functionality, etc. The previous SVN repository allowed write access to be granted to a user to either the entire repository or none of it. Everyone can read it. This restriction has been a limiting factor in our ability to accommodate new developers who may not be ready to have access to the entire system but we may want to give them access to a particular subsection, experimental branch, etc. Today we are announcing changes to the SVN repository that will allow such access. As part of that change, we created a new section of the repository for Contributed Modules to FreePBX. These modules have not yet or will not become part of the primary project but are available for all to access and for the authors to maintain. This is great news for both contributors and the users who are interested in getting access to these modules. You will no longer have to go looking for that tarball stored away in ticket XYZ and we will now be able to give individual contributors access to their own modules so that they can maintain them and provide visibility of changes and fixes just like you have with the rest of FreePBX. We are excited about this new capability which is just one more step in our [url=/freepbx-development]Open Source Development Philosophy[/url] to allow expanded access and community involvement in this great project! If you have previously pulled code directly from SVN (with the [i]svn co[/i] command), then you should visit the [url=/support/documentation/installation/upgrading-your-system#svn]Installing From SVN[/url] instructions which will describe how you can [i]switch[/i] your current SVN copy to point to the new URL location using the [i]svn switch –relocate[/i] svn command. For normal every day use and and access to the Module Admin Online Access within FreePBX, there is no change. Everything will continue to run as always. If you have previously contributed a module or have been hosting your own module and would like to get it in the repository you can either contact one of the developers (look for us in the #freepbx-dev IRC channel) or just [url=/trac/newticket]open a module submission ticket[/url] and either attach the tarball or give us a link where we can get it and add it to the repository. We will then provide you with access to it so that you can maintain it properly. Previous PostFollow Me or VmX Locater™ – Which One is for You?